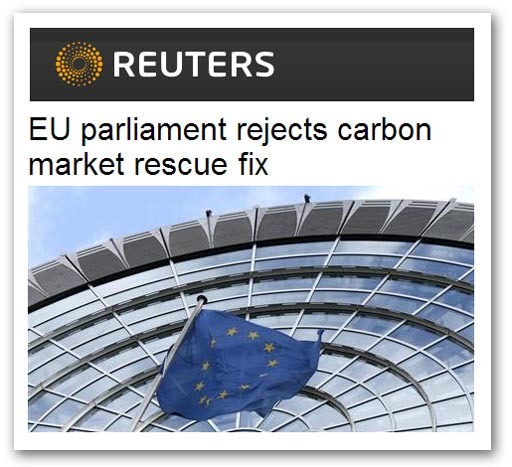 Anyone who has any doubts that the European Parliament is a growing force in the EU needs only to visit the Reuters report on its rejection yesterday of the Commission's temporary plan to prop up the carbon market. This all started back last year, when the Commission decided to do something to arrest the decline in the price of the EUAs (carbon credits) which were languishing at about €7 per ton, as opposed to the €30 that they were expected to reach at this stage. In the July, the Commission had floated three options: delaying the auctioning of 400 million, 900 million, or 1.2 billion credits until the end of the 2013-20 period, in order to force up the price, a process known as "backloading". In order to do this, the Commission needed the power to alter the timescale of permit auctions, claiming it was necessary "to ensure an orderly functioning of the market". The proposal to put this into effect was published on 25 July 2012, and it was this which came up for approval in Strasbourg yesterday. By November, serious reservations were being expressed, and already MEPs had been uneasy about the proposals, arguing that the last thing a fragile economic recovery needed additional costs heaped on energy usage. So, when it came to the crunch, the Parliament turned down the Commission's plan – by the slender margin of 19 votes (334 against the proposal and 315 for) - leaving the carbon market "in a coma". The vote was lost partly owing to a rebellion by the UK's Tory MEPs, who defied David Cameron on this, the official British position being to support the attempts to ramp up the carbon price. As a result, from midday yesterday when carbon credits were trading at €3.15, after the vote they plummeted to €2.63, down on the previous all-time low of €2.84 last year. It is not only the Parliament that has opposed the plan. At Council, Poland - heavily reliant on carbon-intensive coal – was against the idea, and Germany has failed to take a formal position because of divisions within its government on the issue. German Economy Minister Philipp Roesler typified the antis, declaring: "Reducing the number of emissions certificates would be an intervention in a functioning market system. It would place an additional burden on our industry and harm the competitiveness of Germany and the whole EU". With the UK government committed to driving the carbon price up to £18 in 2018, to £30 in 2020 and to £70 in 2030, using the carbon tax mechanism, we now face the spectre of the EU's carbon market collapsing completely, leaving the UK as the only country in the EU handicapped in this way. There is, however, one good thing to come out the debacle. Yesterday's vote has severely upset Bryony Worthington, founder of the environmental group Sandbag, and author of the Climate Change Act. "The carbon market in Europe has suffered a real blow today", she complains. "The world is watching and the EU must continue to show leadership", she had previously warned. It was, and it did – or, at least, the MEPs did. But not the way our Bryony wanted. We are so sad.